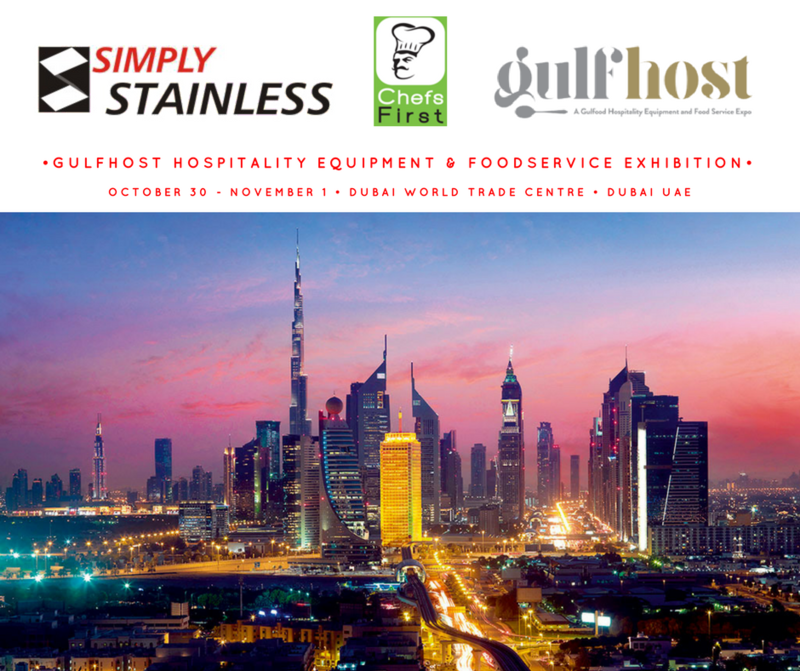 October 30th – November 1st is just around the corner, and the next expo we’ll be exhibiting at, for the second year in a row, is the GulfHost Hospitality Equipment & Foodservice Exhibition in Dubai. It’s a great couple of days to showcase in Dubai. The events are expected to attract more than 50,000 visitors! GulfHost will specifically unite hospitality solution providers, suppliers and kitchen equipment manufacturers. Exhibitors will introduce state-of-the-art bar/counter, front-of-house and back of house products. For anyone working in the hospitality industry, it will be a great opportunity to network with industry innovators. Everyone can participate in live cooking demos, equipment displays and partake in unique product launches. According to GulfHost, the UAE is experiencing rapid growth in the hospitality industry. Huge UAE hospitality industry growth means huge demand for quality stainless steel commercial kitchen equipment. As you can see with the figures in our infographic, the UAE has a serious need for a quality stainless steel supplier. We’re excited to get involved in such an up and coming region. One of the benefits of using our modular system is that it was designed specifically to cater to fast-paced industry growth. We guarantee a constant supply of readily available steel equipment. We achieve this by offering stock that is available for next day delivery and consolidating our equipment packaging so that it arrives at your door flat-packed, which makes it easy to transport. This also makes for a straightforward delivery, assembly and installation process that does not compromise on quality. Our stainless steel product range is designed around a flexible and adaptable system. This ensures the product is fit for purpose for every application. If required, the system can also be used in conjunction with bespoke sheet metal fabrication, especially when using our extensive accessory range. To make your life a little bit easier, we’ve put together a know before you go breakdown of expo details. See you there! Location: The Car Park is located next to Novotel & Sheikh Rashid Tower car park adjacent to Trade Centre Arena and Halls 1&2. Free parking is available opposite the Novotel Hotel in Car Parks B, C, and D.
Payment: Parking is operated 24/7 and there is a fee of AED 10/hour. You have 15 minutes to pay and exit the carpark. Lost parking ticket charge is AED 150.